Interweave Healthcare provides healthcare products designed to deal with the most demanding of situations from waterproof pillows to antimicrobial cubicle curtains and from flame resistant sheets to strong patient lifting equipment. All of these products are already available online to order today. However, sometimes our customers request custom orders of something different to fulfil a particular function in their organisation. We’re always very happy to help and we work hard to source the right quality product at the right price. Patient wear and staff wear can be embroidered with your organisation name or the logo; or even the individual’s name. Our team arranges for the embroidery design to be created, you then have chance to check the design and give the go-ahead. 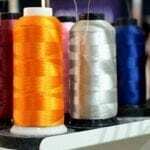 We complete the embroidery work in-house for you. Please allow an extra week for the whole process. You might want the department or ward name stamping onto sheets or pillowcases. We can help with that. We design the stamp and complete the stamping work in-house. Please allow an extra 2-3 days for the products to be stamped. Need scrub suits in a different shade of blue? Or bed sheets in a minty green? Or something else – please get in touch and outline clearly what you need. We’ll do our best to help. You might like the style of one of our patient gowns but need it in a different fabric to match your organisation’s branding. Send us as much information as you can and we’ll do our best to help you.